AND OTHER REASONS TO RENT THIS DESERT HAVEN. Anyone enamored with the desert be warned: This place might require what’s left of your vacation days. Sara and Rich Combs, designers and owners of The Joshua Tree House, are delighting us once again with a new rental. (Meaning, you can do way more than just pin this house–you can stay there)! The Casita is a smaller rental, also in Joshua Tree, fit for four guests in search of a well-styled, breathtakingly beautiful getaway. 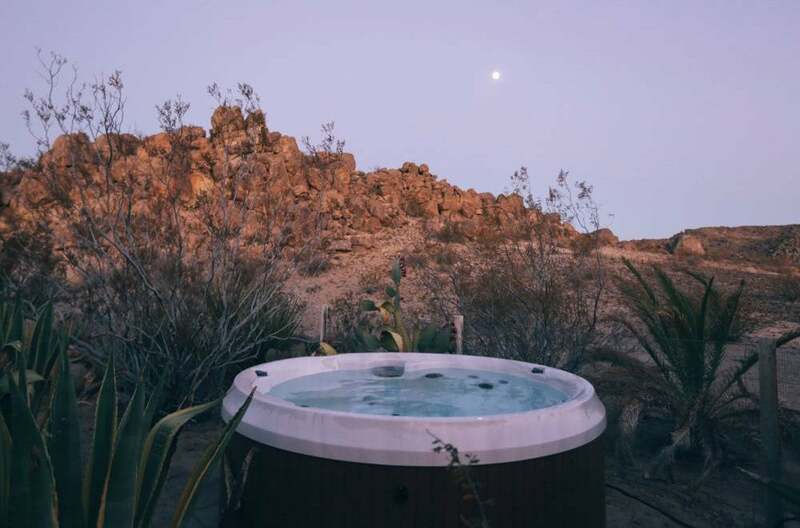 And yes, there really is a hot tub under the stars, meaning we’d likely spend far more time outdoors than in. TELL US ABOUT THE CASITA. HOW DID THIS PROJECT COME ABOUT? After quickly falling in love with Joshua Tree after a one night visit, we couldn’t get the magic of the hi-desert out of our minds. We found and fell in love with The Joshua Tree House (a Craigslist find!) in 2015. After renovating that space and being able to share it with like-minded people who appreciate the calm of the desert, we couldn’t help ourselves but to design another space to share. While we knew that we wanted to renovate another house in Joshua Tree, we found the Casita much sooner than we expected. Once we stepped foot onto the property, neither of us could bare the thought of never returning. So, we put in an offer, and a couple of bids later the Casita was ours! WHAT OVERALL AESTHETIC INSPIRED YOU/CAME TO LIE IN THIS SPACE? Joshua Tree itself has a very special feel that is full of character. New and shiny just doesn’t feel right to us here, so our goal was to find a lot of vintage pieces but modernize them with a western boho vibe. The true reason we fell in love with this property was the landscape. The house was somewhat outdated and needed quite a bit of work, so the property was the main attraction. There are so many amazing plants and animals to see at the Casita, so we wanted to bring the outdoors in as well with some cacti and other plants throughout the house. WHAT IS YOUR FAVORITE MEMORY OF DESIGNING THIS SPACE? We bought a 1969 International Harvester Scout to help us haul materials for the renovations, and well, because it’s really fun. Many nights we would be driving back to the Casita from Home Depot in the Scout, materials all loaded up as the sun would be starting to set. Having the windows down and playing Led Zeppelin on the way home surrounded by the pink and purple sky was always a special moment. We also loved all of the collaborative projects that we worked on for this space. Planning and designing with some of our favorite artists and designers was so so fun! WHAT IS ONE THING YOU WISH EVERYONE KNEW BEFORE VACATIONING IN THIS BEAUTIFUL PLACE? We would want people to know that for all of the inspiration that this place gives us, we owe the land and wildlife here a lot of respect in return. While it’s so fun to see the animals here, it’s best to give them their space and just watch from a distance. A place like the desert that at first sounds barren, is truly full to the brim with life.